Well, here it is. I am finally getting around to putting together my Santorini travel guide. I must admit that I am doing something that I typically hate - putting together a "guide" when I am really no expert on Santorini. As someone who is "something" of an expert on Italy and traveling in Italy, it irks me when I see bloggers who visit once or twice publish a definitive guide on a city or region of Italy. 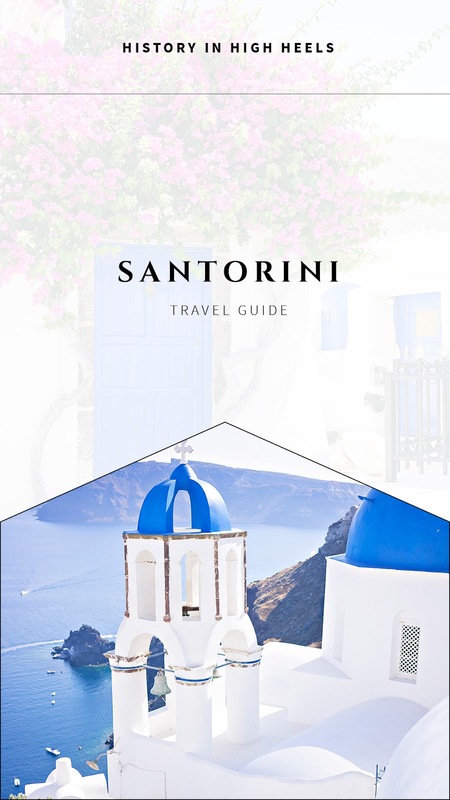 In no way do I intend this to be the only guide you need for all things Santorini. It is simply the places I have discovered and the places I love after multiple successful and wonderful trips to the island. I hope you enjoy! As I mentioned in this post, Santorini is a very easy weekend trip from Italy. Vueling and EasyJet offer multiple flights from Rome, Florence, and Venice during the summer season. Off season it is a but more difficult, but not impossible. You can also fly through/from Athens, which of course offers a plethora of flights to the Greek Islands. If you want to visit multiple Greek islands in addition to Santorini, you can island hop with the ferries. For example, it is about a 2 to 4 hour journey from Mykonos (depending on the ferry). You can find more ferry info here. One thing to note - Santorini is technically a collection of islands. The main island is called Thira, not to be confused with the capital city of the island, Fira. Most commonly refer to Thira as Santorini, but it can be important to remember this technical distinction when booking transport. Thira (or "Santorini) is dotted with cities and villages you can stay in. The most famous and popular are Fira, Oai, and Imerovigli. These cliff-side towns sit high on the western side of island overlooking the caldera. They offer amazing views and lots of exclusive resorts to choose from. If you want a more local (and cheaper) experience I suggest staying in one of the beach towns on the east side of the island or a traditional village in the interior of the island. My favorite beach town is Kamari and I love the traditional villages of Pyrgos and Emporio. You can also stay in a traditional cave house in Exo Gonia. You don't have to worry about where you stay in relation to what you want to see because the island is small and getting around is super easy. All of the cities are well connected via public bus and you can easily call a taxi to get from town to town (and it doesn't cost a fortune). My favorite way to get around and see the island, however, is an ATV! There is a plethora of rental companies on the island that offer all kinds of ATVs and scooters. It is cheap (I paid 20 euros a day) and gives you the freedom to explore some of the less touristy spots. One of my favorite things to do on the island is to explore the less-touristy "traditional villages." Most of these villages are medieval fortress settlements (many were actually Venetian) with abundant white washed cave-style homes, winding little "roads," blue-domed churches, and blooming pink flowers. My favorite villages are Emporio and Pyrgos. Obviously, Santorini's beaches are worth a visit and one of the main reasons people flock to the island. It is super affordable to rent a chair and umbrella for the day in Kamari (I paid just 5 euros for the day and the restaurant will serve you on the beach). If you are looking for something more visually stunning, I suggest either the volcanic red beach or the white beach. There are some cliche things you should definitely do while in Santorini - visit the unruly donkeys in Fira and watch the sunset in Oia. 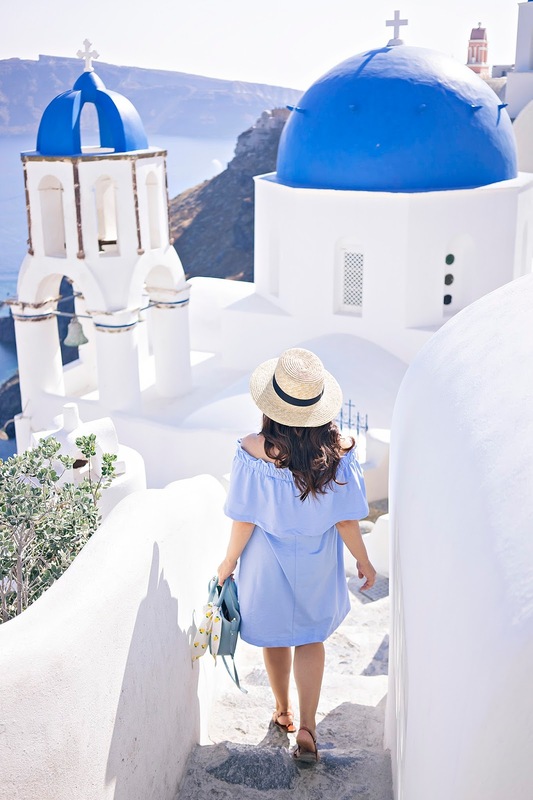 In addition to these, I also recommend wine tasting on the island, a visit to Ammoudi Bay (in Oia), a Catamaran excursion, and, my personal favorite, the hike from Fira to Oia (you can read more about this here). But my favorite activity in Santorini (and all of Greece really) is eating! I have had some of the best meals of my life in Santorini. I still dream about the beet and yogurt dip I had in Pyrgos at Brusco. Below is a round up of my favorite dining establishments. This needs to be booked well in advance if you want the sunset seating (and trust me you do!). My favorite restaurant on the island. My favorite spot for lunch. I love the sampler platter. Two words - homemade baklava! If you have any great Santorini recommendations please share below!